Denver Air Conditioning Repair: Is Your AC Unit Freezing Up? Is Your A/C Freezing In The Summer? Here’s Why! Summer is in full swing here in Colorado. Here’s an often cited scenario with the average Denver area homeowner: They’re sitting in their house, watching Netflix, when all of a sudden – that distant awful sound: drip… drip… drip. How did the leak start? Water heater, leaky toilet, shower, faucet? Nope – your air conditioning unit is frozen. Don’t sweat it though, Premier Heating & Air, your trusted Denver air conditioning repair team can offer hope. 1. Turn the unit completely off at the thermostat, and don’t try to thaw the system by increasing the temperature at the thermostat. Just make sure the A/C system is completely OFF. 2. Confirm that there is nothing restricting the airflow to the system. Replace the furnace or air handler’s filter along with any return air filters. Open all the registers completely and ensure that they are not obstructed by furniture or drapes. 3. Call Premier Heating & Air. 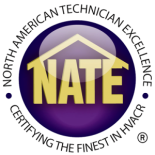 The air conditioning system needs to be inspected by a NATE-certified professional to ensure there are no refrigerant leaks or damage to the equipment. Your technician will diagnose the situation and how to avoid the issue from occurring in the future. If a leak is present (and that is rare, but possible), the leak has to be repaired or the unit will probably freeze again.